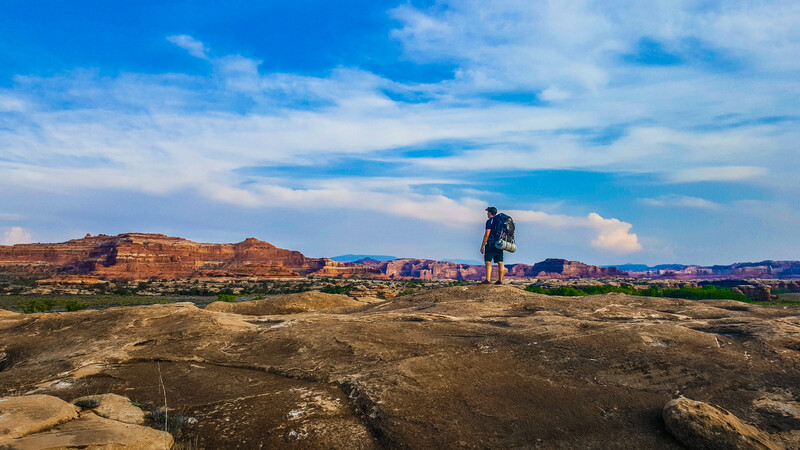 These Canyonlands hikes were both pretty short, so I’m combining them into Hike 26 of my 52 Hike Challenge – the halfway point!! We arrived in the Needles District of Canyonlands National Park and since the Visitor’s Center was closed and the closest town was an hour away, we hit the trails right away! First, we did the short Roadside Ruin Trail. This simple, flat path leads to an ancient granary, where grains and other foods were stored by Native Americans who lived here hundreds of years ago. This granary was built sometime in the late 1200s. Incredible that it has lasted so long for us to view and study. This hike really hammered home that we were in the desolate Canyonlands. There is truly nothing around for miles but chaparral and an occasional lizard. Next up was the Cave Spring Trail. For such a short trail, this really has a wide variety of interesting things to offer. The first part of the loop (heading clockwise) passes by an abandoned cowboy camp. Because of the presence of year-round water (this trail’s namesake) in such a remote spot, cowboys set up camp here while tending to their grazing livestock. The abandoned camp has been preserved for passersby to get a glimpse of the hard, rugged living conditions of the late 1800s-early 1900s ranchers. A little further along the trail you reach the spring and the location of various ancient pictographs. After passing through the spring, it’s like you’re on a completely new trail. Two wooden ladders take you to the top of the rock formation where the trail continues via cairns. From the top of the rock formation you can see practically forever, and the late afternoon light made the mountains and desert glow beautifully. The surface of the top of the rock was full of eroded depressions that made me think of craters on the moon. Although the super remote Needles District of Canyonlands National Park might be off the beaten path and difficult to reach, it is so, so worth it. We only spent one day here but saw so many interesting things. After our hikes in this district we headed to the Island in the Sky District for even more jaw-dropping scenery.